I have recently upgraded my Windows 8.1 to Windows 10. There are few bugs with Windows 10 and few of them are very annoying just like the one “Critical Error: Start menu and cortana aren’t working“. In this error your task bar will stop working, all the keyboard shortcuts which uses window key will stop working. There will be a pop up saying “Critical Error: Start menu and cortana aren’t working” and will ask you to sign out and sign in again to fix it. But signing out and signing back in, even restarting system after signing out is not gonna fix it. This is because of the recent Windows update build 10240. 4. Go to Boot tab in Boot options, enable “Safe boot” and select “Network”. After that hit Apply and OK and Restart the system. 5. Your computer will start in Safe Mode. Now repeat the steps again from 1 to 3 and uncheck Safe Boot in Step 4 and restart. Hopefully, your critical error would be gone and start menu will work properly. Microsoft has acknowledged the bug of critical error which I mentioned and working on a fix which will be coming soon. Previous articleWorking at Binjj – Why you should work at a startup? I recently installed Windows 10 and find out same problem. Due to this, i felt it seems like very difficult to handle. But your post really helps to me. Thank you for sharing. Thanks for help dear. i was suffering from this problem since two weeks. Had a great visit over here on your blog. Thank you so incredibly much for helping us, Abhishek! 🙂 I encountered the same issue just a while ago, found your article and immediately applied your instructions. Problem solved on my end as another proof thanks to your caring genius and post. Stay cool and I wish you all the best! I as of late introduced Windows 10 and figure out same issue. Because of this, i felt it appears like extremely hard to handle. Be that as it may, your post truly serves to me..
It’s really great tips thank you so much I have implemented as you listed. Thank you very much. I did exactly and the error message gone. Recently had this same problem & your fix worked like a charm. Thank you! Keep up the great work! Thank you, Abishek, it worked! I appreciate your useful suggestion. 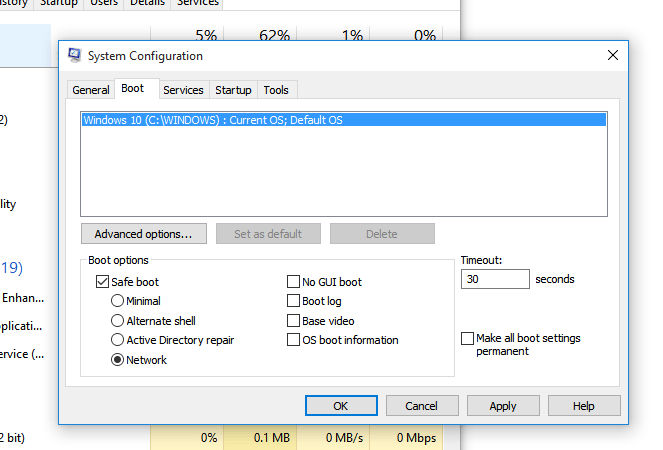 Hi…thanks for this but….when I have restarted the cursor has disappeared and I can’t access the ‘boot’ screen because it’s behind the task manager screen…any help would really be appreciated! it really worked thank you for your help.